All high power LEDs produce heat that needs to be dissipated in order to ensure that the LED junction (the part of the LED that actually generates light) is kept well below it's maximum operating temperature. If you are unfamiliar with cooling electronic components such as high power LEDs, then before reading any further, we highly recommend that you watch this excellent video tutorial about Thermal Heatsink Design featuring Dave Jones from the Electronics Engineering Video Blog. The number of LEDs you are powering. The temperature of the environment in which the LEDs are operated. Whether the LED is mounted in an enclosed or open space. Ideally you would perform a detailed thermal analysis using thermal modeling software to design an effective cooling system, but since this type of software is usually quite expensive, most designers take a more empirical approach using trial and error to determine just how to effectively cool the LEDs they are powering. The sum of all the thermal resistances between the LED junction and the ambient air. The amount of heat to be dissipated in watts. The ambient air temperature in which the LED will be operated. With all of this information, you can use the calculator below to determine what the minimum °C/W rating you will need for your heat sink. Note that the calculator we provide can only determine the °C/W rating of the heat sink needed for a single LED. You could use the results as guidance in selecting a heat sink for multiple LEDs, but that will not consider factors such as the distance between each LED, total wattage of multiple LEDs, etc. So you would need to experiment further to ensure that the heat sink you select will be adequate. Enter the forward voltage (Vf) rating of the LED and the current in mA that you will be operating the LED at into the Vf and I boxes. This will determine the amount of power (in watts) that needs to be dissipated. As this calculator can only provide results for a single LED, you will not be able to enter a value in the Number of LEDs box. Enter the maximum junction temperature at which you want the LED to operate. The technical documentation for the LED will provide the recommended maximum LED Junction Temperature, but you will want to stay well below that value as the cooler you can keep the junction temperature of the LED, the longer the LED will last. The color output of the LED will also be more accurate and stable if the junction temperature is kept low. For example, if you check the technical document for cool white Rebel LEDs, you will find that the maximum LED Junction Temperature is listed as 150°C. However, ideally you would want to operate the LED well below that limit. Say, 100°C, for example. The trade off, of course, is that you will need a much larger heat sink to keep the junction temperature of the LED at a lower temperature. If you are having trouble coming up with a high enough °C/W value using the calculator (higher °C/W values means you can use smaller heat sinks), then try making small increases in the junction temperature until you find a °C/W value that will work for you. If at all possible, you should avoid operating Rebel LEDs at junction temperatures much above 100°C. This is because there is a significant drop off in the projected lifetime of the LED as you get closer to the maximum operating temperature.. You will find a number of graphs that illustrate this drop off on pages 7 to 12 of Lumileds Rebel LED Reliability document. Enter the air temperature in which the LED and heatsink will be operated. Enter the thermal conductivity of the interface between the LED junction and the base (the thermal pad) of the LED. 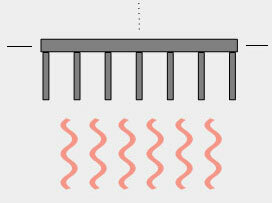 This is usually called Typical Thermal Resistance Junction to Thermal Pad (°C/W) in the LED technical documentation. Enter the thermal conductivity of the mounting base for the LED. Usually the base is an aluminum or fiberglass PC Board. If you are purchasing a Rebel LED from us that is premounted to an aluminum star or square base, then use 6 °C/W in this box. If you will be mounting a Rebel LED to your own PC Board, then enter the thermal resistance value of the PC Board material you will be using. Enter the thermal resistance of the material that you will be using to attach the LED base to the heat sink. If you are using our pre-cut Berquist thermally conductive tape, then enter 4.5 °C/W in this box. If you are using a different method of attaching the LED to the heat sink, then enter the °C/W value in this box. Once you have entered all of the values into the boxes in the calculator, click the Calculate button to determine the °C/W value of the heat sink that you will need to operate the LED at the junction temperature you specified in step 2. Once you have this value, you can then decide which heat sink to purchase. You will find the °C/W rating for all of the heat sinks that we offer on this website, on each product's detailed information page. Any heat sink with a value that is equal to or lower than the °C/W value generated by this calculator should be suitable. However, you will still need to confirm that the heat sink is providing adequate cooling by measuring the LED junction temperature. Lumileds has produced a document that details exactly how to measure LED junction temperature here. IMPORTANT NOTE: This calculator must only be used to provide initial guidance in selecting a suitable heat sink. You must verify that the heat sinking you are using is suitable for your specific application by physically checking the operating temperature of your assembly and calculating the LED junction temperature as described in this document. Disclaimer: While we have made every effort to ensure that the results provided by this calculator are accurate, we recommend that you independently verify any calculated results. This calculator is provided “as is” without expressed or implied warranty. QUADICA DEVELOPMENTS INC, NOR ANY OF THEIR EMPLOYEES SHALL NOT BE LIABLE FOR ANY DAMAGES OR LOSSES INCLUDING, BUT NOT LIMITED TO, DIRECT, INDIRECT, SPECIAL, INCIDENTAL OR CONSEQUENTIAL DAMAGES OR OTHER LOSSES ARISING OUT OF THE USE OF THIS CALCULATOR.